by Geoffrey Ciani – With nearly half his face covered in flowing streams of blood, Juan Manuel Marquez resembled something out of a zombie movie during the sixth round of action in his fourth fight against Manny Pacquiao. Despite suffering a solid third round knockdown from a sneaky Marquez right, Pacquiao seemed to have momentum on his side after scoring a nice knockdown of his own in the fifth. This came compliments of a sharp Pacquiao left that buckled Marquez to the point his glove bounced off the canvas in a spontaneous effort to reestablish balance. Pacquiao turned up the heat following the knockdown and began growing bolder throughout the sixth, and all the while Marquez was patiently trying to fend off Manny’s attacks while looking for something in Pacquiao’s rhythm he could exploit. And then it happened, he found it—BOOM!—fight over, just like that! Pacquiao never even saw the punch coming. It was a tremendously calculated right hand that Juan threw with meanest intentions, and Pacquiao wound up exactly where Marquez anticipated he would be before even launching the thunderous knockout blow. Watching Pacquiao fall face first onto the canvas, and then remaining there motionlessly with his right arm partially under his body—it was something that was simply surreal. In terms of the sheer brutality of the knockout, it was surely right up there with Antonio Tarver’s second round knockout against Roy Jones and Sergio Martinez’s bomb against Paul Williams. It even was eerily reminiscent of the devastating shot Pacquiao finished Ricky Hatton with more than three years ago. But watching an icon like Pacquiao collapse as if he had been shot at close range in a sneak attack by a stealth assassin was just one of those moments that will forever live on in the annals of boxing history. It actually reminded me of watching a dazed Mike Tyson helplessly groping for his mouthpiece after being absolutely bludgeoned by Buster Douglas. That was the power and magnitude of the imagery on display. This officially ends Pacquiao’s sensational run that began when he first ventured north to welterweight and faced Oscar De La Hoya (or you can even really go back as far as to following his loss against the great Erik Morales). Sure, Pacquiao officially lost last time out against Timothy Bradley in a bout where most observers disagreed with the official judges’ scorecards. And yes, a lot of onlookers felt Pacquiao actually deserved to lose in his third match with Marquez. Even still, this was the moment where it truly ends beyond even the slightest shadow of a doubt. The Pacquiao reign of dominance is over. The aura of invincibility that Pacquiao possessed during his historic run against bigger foes was truly a marvel that generated a great deal of intrigue and excitement for boxing fans. But even though it was a great run for Pacquiao, that aura is gone forever. It is almost ironic that it would ultimately take a smaller foe to derail the Pacquiao express, but it is also somewhat fitting and poetic considering the long history of this epic boxing rivalry. Marquez did something I was personally not sure would ever happen in this series, regardless of how many times they fought. He won, and won decisively. For the first time following a Pacquiao-Marquez fight, there is no controversy, no dissenting voices, and no outcries over the officially rendered verdict. Marquez secured himself the one victory that has long escaped him during his illustrious career, and with tonight’s knockout he can finally celebrate the career defining victory he has longed for. Marquez was simply a boxing wizard inside the squared circle on this evening. His timing, as always, was impeccable. He started patiently as he always does, because it takes an intelligent boxer like Marquez some time to familiarize himself with his opponent’s mannerisms. He has a superb ability when it comes to studying a fighter’s patterns and habits, learning to anticipate their next moves, and creating angles for himself while simultaneously minimizing his opponent’s opportunities. Usually when Marquez has success exploiting a given weakness early in a fight, he tends to get better at seizing those moments and capitalizing as the action progresses. In that sense the third round knockdown, which itself seemingly came out of nowhere, acted as a foreshadowing of things to come. It is impossible to say. Will Pacquiao want a fifth fight with Marquez? Will Marquez want a fifth fight with Pacquiao? For Marquez, this is almost a fitting note to end his career on. There will never be a bigger and more dramatic victory for him to follow and sail off into the sunset. It could be a good time for him to bow out. Or maybe he will want the fifth fight and the bigger payday that comes following this victory. Or who knows? Maybe, as unlikely as it would have seemed then, a rematch with Mayweather could even be in the cards for Marquez. For Pacquiao, on the other hand, it seems like he only has two plausible choices—fight Marquez again or retire. The demand for a fight with Floyd and Pacquiao may possibly have something to be salvaged, perhaps down the line, but for now that seems like a dead end road that nobody will care to venture down. Beyond fighting Marquez again or calling it a career, Pacquiao has nothing worthwhile. It is an either or dilemma for him at this juncture. Whatever happens next for each pugilist, Juan Manuel Marquez deserves his time to shine in the spotlight. He earned it, and made a career defining statement that he will forever be remembered for. 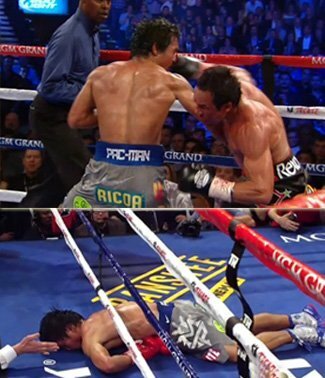 Previous boxing news: Manny Pacquiao: “I Am Fine”; Pac knocked out by Marquez, what next? Next boxing news: Pacquiao-Marquez IV – The Shock Of The Year, The Fight Of The Year, The Round Of The Year, The KO Of The Year! You are here: Home / Boxing News / Juan Manuel Marquez scores shockingly surreal knockout against Manny Pacquiao!